While I’m certainly not the greenest person in the world I do bring reusable shopping bags to the store. On a recent trip to Kroger it was business as usual, even mentioned to the checkout that I had my own bags. Well instead of trying to fit two bottles of wine into my grocery bag she starts whipping out the plastic. 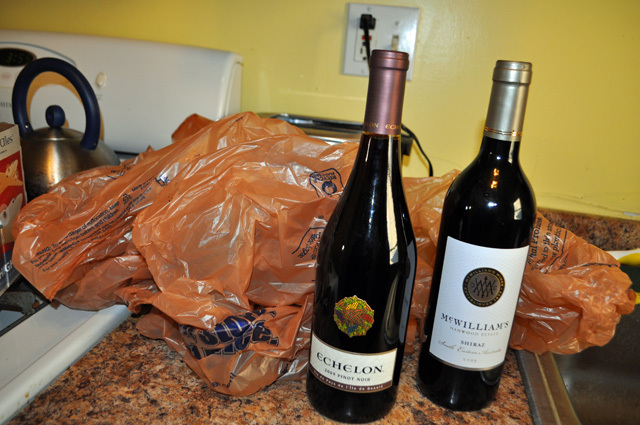 Using not one, not two, not three but FIVE plastic bags for two bottles of wine. Now come on! I’m not going to be trekking into the wilderness on unpaved roads when I leave. Bringing your own shopping bags is supposed to curtail the passing of plastic. 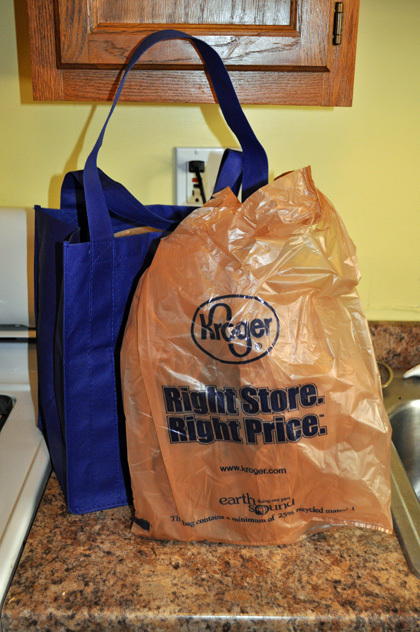 This is not the first time that Kroger has went over board with bagging items, putting just one or two items in a bag and moving on. I’m starting to wonder if they don’t get paid per plastic sack used. This entry was posted in Uncategorized and tagged Kroger Bags, Kroger Complaint. Bookmark the permalink. That just really frets me when they do that!! And I have to go to a landfill to take my trash – the first thing you see are those plastic bags blowing all over the place – disgusting. I encourage everyone to use reusable bags. And if you do happen to get those plastic bags, recycle them – or take them to a place that will. Many thrift stores and consignment shops are happy to reuse them. And notice the “Earth Sound” on their bags.